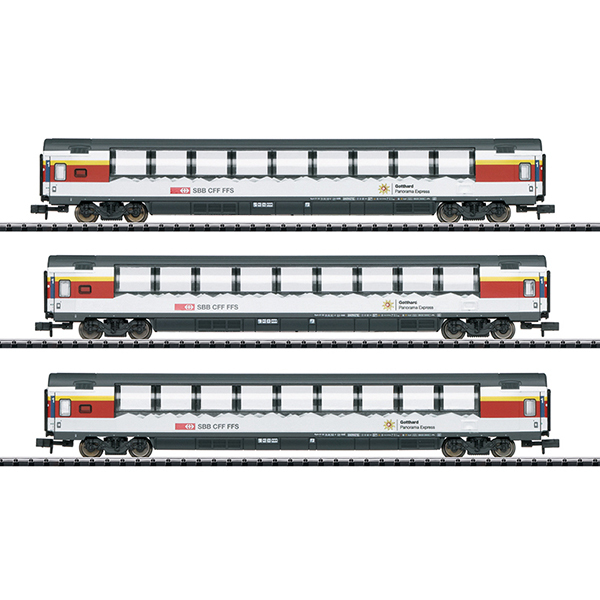 Prototype: 3 Swiss Federal Railways (SBB/CFF/FFS) type Apm express train passenger cars. Open seating cars with high observation windows extending up into the roof area. Current use: Gotthard Panorama Express "GoPEx". Between 1989 and 1995, the SBB purchased a new open seating car, types Apm EC RIC and Bpm EC RIC, for the EuroCity train class to replace TEE trains in European long-distance service. The so-called Mark IV (EW IV) formed the basis for this. Both car classes were given the same car body with ten windows between the pivot-and-slide doors on the ends of the cars. Their roof was similar to the French Corail cars, their skirting ran down deeper than on the Mark IV cars, and they followed the UIC-Z1 standard in their dimensions. They were fully RIC-compliant and were authorized for a maximum speed of 200 km/h / 125 mph. Seventy (70) type Apm and one-hundred-fifty-five (155) type Bpm units were delivered. In addition, there were another twelve of the so-called Panorama cars, 1st class, (type Apm Pano RIC) that had raised car bodies and panorama windows. The floor height was raised compared to the other cars in order to improve the view for passengers even on routes with noise insulation walls, and the windows stretched from the armrests up into the car roof. The entire design was subordinated completely to good visibility. Initially, the Panorama cars ran in international service to Italy, Germany, Austria, France, and the Netherlands. At the beginning of February 2008, the SBB management board decided to update all EC cars fully and to make them handicapped accessible. By 2015, a closed toilet system, a passenger information system, signal boosters, as well as plug-ins for laptops and cell phones was installed and all seats, window, wall, and ceiling elements were replaced or overhauled. The Panorama cars now run in Switzerland in Intercity and Interregio service as well as in international passenger service to Austria. A special use has been taking place however since April 14, 2017 on the Gotthard line. Indeed, since the end of 2016, it has now been possible to rush in a straight line through the Gotthard Massif, thanks to the longest railroad tunnel in the world - the Gotthard Base Tunnel. Yet, a marvelous trip possibility over the old Gotthard line was created for Panorama passengers and railroad fans. The Gotthard Panorama Express runs in the spring and summer months between Lucerne and Lugano with several of these EC Panorama cars and thrills people with the enjoyment of looking. More than 200 bridges are crossed and passengers experience this trip through seven reverse tunnels with the fascinating change of nature as in the past and the interplay of environment and technology.